This page gives ECYSA referees some guidance on using the web site for the various tasks referees must do during the course of a season. To perform these tasks, login to your referee account (if you don't have one, contact the referee assignor!). At the top of the page, look for the Referee option. 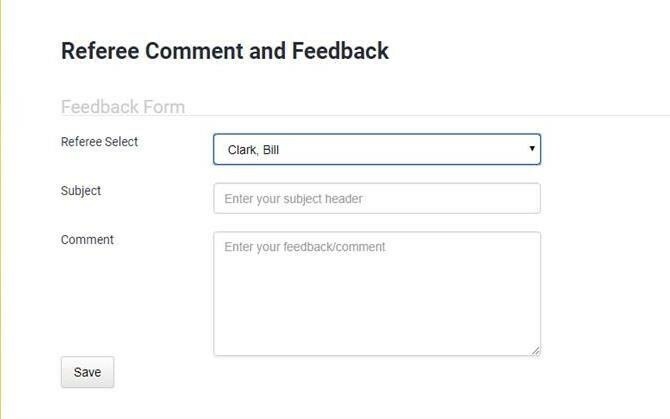 Under there, you should see your name and then some options. More information on these options is shown below. This is where you would look to see games that have been turned back from other referees. These games are yours to grab if you are available...you can check this as often as you like... And don't forget to check the list frequently during the season and on game days! The list of available games can change dramatically at any time in the day and make sure to select a date range to search games in future weeks, Sundays, etc. You don't need to be "available" to snipe games from the substitution list. However, you will only see games for which you have been approved by the Referee Assignor based on the Grade Group of the game. 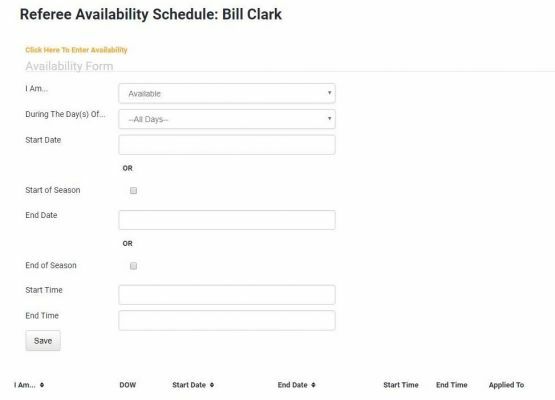 The system will not show you games at times when you are already scheduled to work. Similarly, if you a coach, then the system will not show you games at times when your team is scheduled to play. This is just a quick weekly (or monthly) schedule view with Google Maps link to field location. 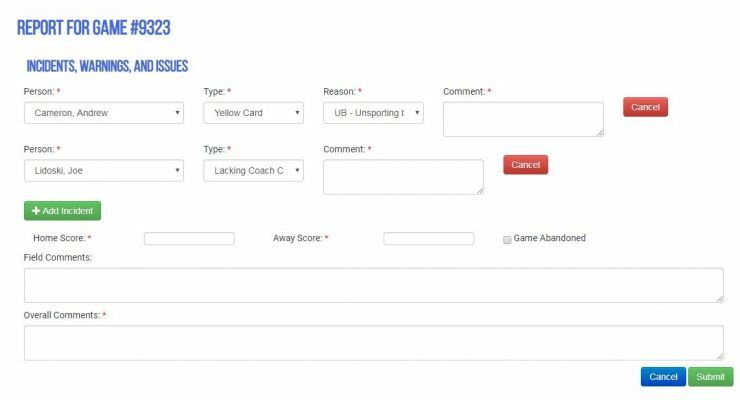 For every game in which you are assigned, you need to fill out the game report (it populates the score in our standings and confirms you were there for payment). The report is very easy to use and provides you the ability to assign cards to players, detail incidents, etc. New for Spring 2019! You can now report your games prior to the end of the game's time block. So, while you're waiting to start that 10:30 game, post the result for the 9:00 game via your phone right away! This is for games with more than one assigned Referee (e.g. Spring Sunday games) or for a Mentor Referee if assigned and essentially provides the ability for a referee to give feedback on another referee.